R.H.W. Dillard’s books of poetry include, most recently, Not Ideas (forthcoming from Factory Hollow Press, 2014), and What Is Owed the Dead (Factory Hollow Press, 2011). He is also the author of Sallies (2001), Just Here, Just Now (1994), After Borges (1972), all published by Louisiana State University Press; News of the Nile (1971), The Day I Stopped Dreaming About Barbara Steele and Other Poems (1966), both published from the University of North Carolina Press; and The Greeting (University of Utah Press, 1981). Dillard is the author of two novels, The First Man on the Sun (Louisiana University Press, 1983) and The Book of Changes (Doubleday, 1974). 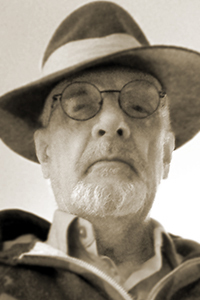 He has also published a collection of short fiction, Omniphobia (Louisiana State University Press, 1995), and two critical studies, Understanding George Garrett (University of South Carolina Press, 1988) and Horror Films (Monarch Press, 1976). He is the coauthor, with George Garrett and John Rodenbeck, of the screenplay for the 1965 film Frankenstein Meets the Space Monster, rereleased on DVD (Dark Sky Films, 2006). Dillard is the recipient of the 2007 George Garrett Award for Outstanding Community Service in Literature, the 2003 Hanes Prize for Poetry, and the 1994 O.B. Hardison, Jr. Poetry Prize from Folger Shakespeare Library. He is a member of the Fellowship of Southern Writers.